Entertain in style with this guide to the best holiday recipes and meal planning ideas that will make your celebrations memorable. Fortunately, I had all that I need in the palm of my hand with my new Intel 2 in 1. The Acer Aspire Switch 10’s docking keyboard offers only one port, a single full-size USB 2.0 port. 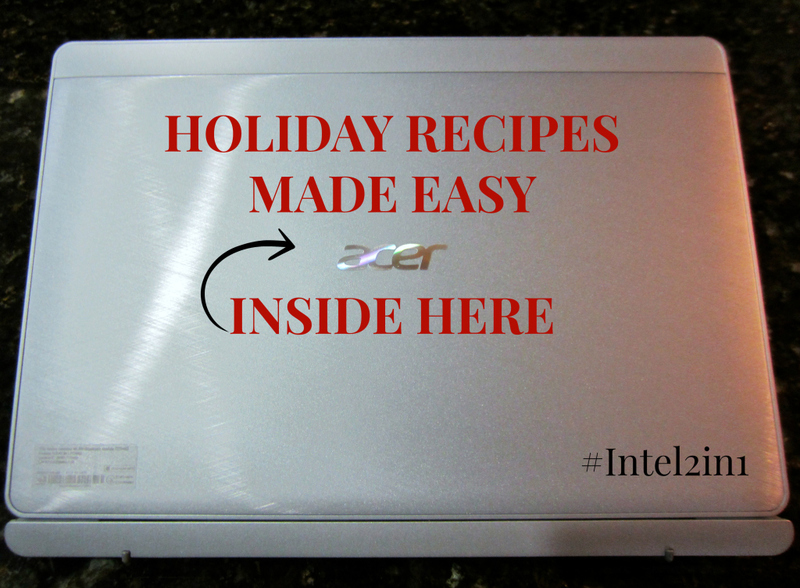 This worked really well for me to easy download my family’s (mom’s and sister-in-law’s) holiday recipes from years past. The tablet also has 64GB of solid-state storage. This can easily be supplemented with Acer’s own cloud storage (AcerCloud). I also use the Evernote app on the start screen to create my shopping list for the market and also my Christmas menu. Inside, the Aspire Switch 10 boasts dual-band (2.4GHz and 5.0 GHz) 802.11n Wi-Fi, along with Bluetooth 4.0, which helps me out A LOT as I surf the web for new recipe inspirations and syncing my Intel 2 in 1 tablet with my computer. Breakfast Casserole is my easy Christmas dish that we enjoyed many years with my family! This year will be no different. Fortunately, I have the recipe on hand when I go shopping and when I prepare the night before Christmas. 😉 This is also great for holiday brunches at your in-laws or church potlucks. Honey-baked Ham is our family’s traditional meat on Christmas. Since we are stuffed from turkey on Thanksgiving, and we eat lamb on Easter. A sweet ham goes perfect for our Christmas feast. Its spiral slices make it easy to served and an attractive presentation at the dinner table. We think Petit Jean Honey Cured Ham is the best we’ve ever tasted. Broccoli Casserole is what my mom used every Christmas when I was little. We kids could never get enough! It was our very favorite Christmas vegetable. If you have children, or have some coming to visit, I guarantee that they will eat and enjoy this veggie side dish! Even though I rarely cook with canned condensed soups, I still make this yummy broccoli casserole during the holiday season. It’s fabulous with a Christmas ham and twice-baked potato too. Be sure to use sharp Cheddar cheese for a nice full flavor! Twice Baked Potatoes are great to make ahead of time! They’re extra yummy because extras like butter and cheese are mixed in. For variety, sprinkle top of potatoes with real bacon pieces just before serving. Apple Pie has to be the classic dessert for Christmas. I have yet to meet someone who does not enjoy a slice of the pie. Add cinnamon and the pie becomes perfection. It is quick and easy and ensures a perfect result every time. Use a combination of Granny Smith apples and Honeycrisps apples for the best filling, eating apples don’t soften the same way. Chocolate & Peanut Butter Chip Pretzel Cookies takes your chocolate chip cookies to the next level. Why should Santa get the best chocolate chip cookies?! When baking chocolate chip cookie recipe, I am a stickler for using one stick of butter at room temperature AND the combination of brown sugar and granulated sugar which gives the cookies terrific flavor. And do not use a scooper—the tool compacts the cookies too much. What is your favorite holiday eats? Please share your recipe below!